Straight from the labs of Marware, the Sportfolio Sleeve is something I’ve been carrying between my travels for my podcast recording sessions and it’s spacious interior along with the ability to store my iPod in the outside pocket means that my portable Apple collection can always be taken with me. Available in both 13-inch MacBook and 15.4/17-inch MacBook Pro versions the interior of the sleeve allows for comfortable fitting for my MacBook Pro 15-inch model. Even with the Speck See-Thru polycarbonate shell attached to my MacBook Pro, thanks to the material that this sleeve is made of, I was still able to fit it inside and close the zipper without a struggle. 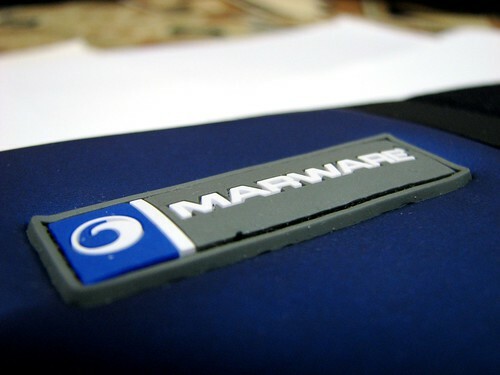 Neoprene seems to be the material of choice for Marware, as it makes an appearance in many of their products. 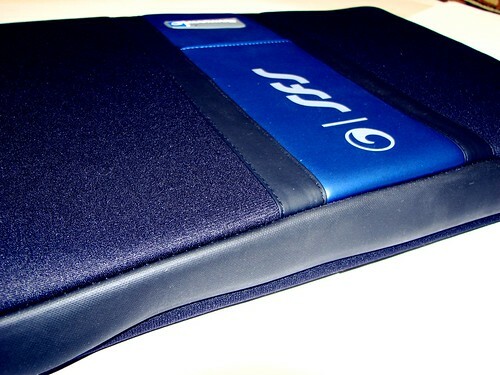 Not only is this perhaps the best material for this type of application, it is probably most suited as well since it’s lightweight and soft characteristics offer a flexible fit in that it can stretch and has waterproof elements to it as well. Whilst we don’t recommend you start taking this case with your Mac scuba diving or swimming anytime soon, for the occasional accident or walk in the rain you can be confident that your expensive Mac won’t get wet. 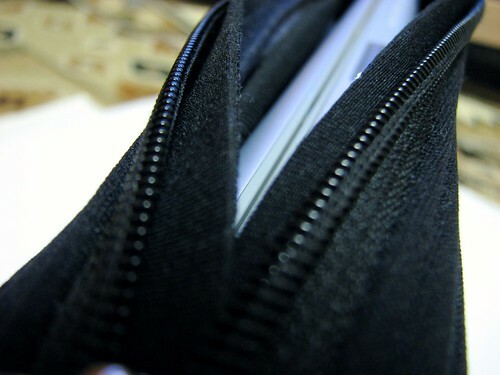 An important design feature in any sleeve that is figure hugging is the zipper. You don’t want the zip to scratch the polycarbonate plastic or the anodised aluminium chassis of your precious notebook so having an extra lining that separates the zipper from the interior of the case is very important, because without it you could end up scratching the casing of your notebook each time you open and close the zipper. Along the bottom and the sides of the case, rubber grips are integrated in to the sleeve for easy of handling. Some sleeves use the same material all over and if it’s anything like neoprene it could very easily slip out of your hands when you’re in a rush. Not so with the Sportfolio, the rubber sides ensures you have a comfortable grip that won’t slip out of your hands so easily. On the exterior you have the Orca ‘skin’ as it’s described in the product literature. 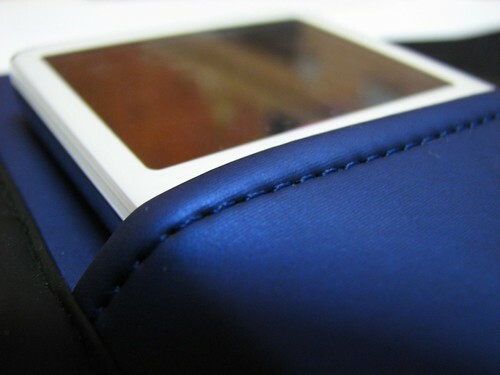 It’s essentially a pocket for you to hold either your phone or more likely, an iPod of some description. I can imagine some situations where this would not be ideal but in others it would be great to be able to keep my iPod out of my pockets but close enough for me to use it whilst I’m on the move. Marware have yet again surpassed themselves with a good quality product at a reasonable price. Without any extra gimmicky features or bold design tastes, the Sportfolio Sleeve makes for an ideal companion for your portable Mac. The front holder for your iPod, phone or most things portable is a nice finishing touch but is just too small to hold larger items like my notebook mouse or for larger digital compact cameras.